😎 Good Tuesday morning, and welcome back on Shutdown Day 32. 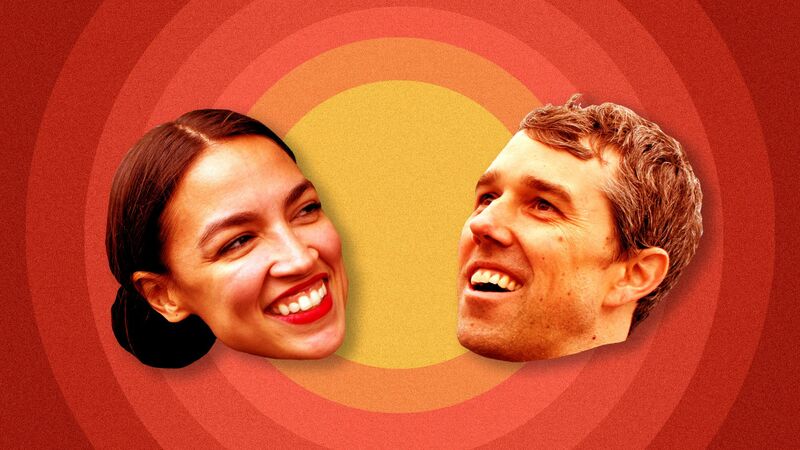 Rep. Alexandria Ocasio-Cortez (D-N.Y.) and former Rep. Beto O'Rourke (D-Texas) are political and cultural phenomena — one known by her initials, one by his first name. Like Drake or JFK or RG3. Both arose from nowhere seven months ago, during the midterms, and today are everywhere. Both are hotter than establishment Democrats on social platforms and among staffer-wannabes, the press, donors and activists. Jon Cohen, SurveyMonkey's chief research officer, tells me: "These data show the phenomenon is real — she tops Sen. Schumer in favorability among Democrats, and overall nearly rivals Speaker Pelosi." Ocasio-Cortez, described by Bloomberg Businessweek as "the Darling of the Left, Nightmare of the Right," is driving an actual policy debate on taxes, Medicare and free tuition. Last week, she taught a social media class to older House Dems. O'Rourke, 46, gets coverage for hitting the road on a solo road trip to fuel 2020 buzz and shake off what he called a "funk" after losing to Sen. Ted Cruz. But one Democratic operative tells the N.Y. Times that some chafe at his "Beto-first politics." Neera Tanden, president of the progressive Center for American Progress, told me: "Both of them understand that people are tired of traditional politics and looking for authenticity." In remarks that he yesterday tried to walk back as "hypothetical," Giuliani admitted Trump's team may have been working on — and updating him on — a potential Trump Tower in Moscow all the way up to Election Day. 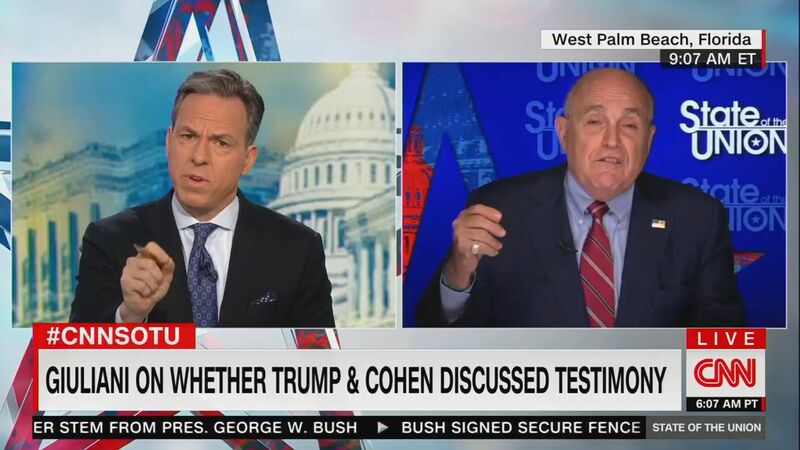 Giuliani suggested that then-candidate Trump was aware of — and discussed — the deal far longer than previously disclosed. Giuliani, relaying a quote from the president that hardly sounds hypothetical, said in an interview with the N.Y. Times that Trump had told him the Trump Tower Moscow discussions were "going on from the day I announced to the day I won." Why this matters: Imagine there was no drip, drip, drip — and we learned in one fell swoop that an American presidential candidate was secretly negotiating a multibillion-dollar business deal with an enemy of the United States (and falsely denied it) while that nation was seeking to tip our election in his favor. This allows Trump and others to say: "This isn’t new." Or: "Trump disclosed this earlier." A break in the misinformation crisis ... The chaotic media environment is driving a renewed interest in fact-finding, Axios media trends expert Sara Fischer reports. Over the last year, the number of respondents around the world who consume traditional news weekly or more, and share or post news content several times a month or more, has increased by 14 points — from 26% to 40%. Why it matters: This is a huge change from the same survey's results from one year ago, when most people said they were turning away from traditional media because they thought it was biased and driven by clickbait. According to the Edelman survey, trust in traditional media in the U.S. and Europe is higher than trust in search and social platforms. An earlier study from Gallup showed a similar rebound in media trust overall in the U.S.
Red flags: A majority of Americans still feel the news media doesn't understand them, according to a recent poll from Pew Research Center. "Doris Cochran, a disabled mother of [6- and 8-year-old] boys, is stockpiling canned foods these days, filling her shelves with noodle soup, green beans, peaches and pears — anything that can last for months or even years." Cochran — who lives in subsidized housing in Arlington, Va. — plans to sell some homemade crafts and clothes, including the "ugly sweater" above. Why it matters: "For those like Cochran who rely on federal aid programs, the social safety net no longer feels so safe." "As the longest government shutdown in U.S. history stretches into a fifth week, millions of poor Americans who depend on food and rental assistance are becoming increasingly worried about the future." "The USDA announced earlier this month that the Supplemental Nutrition Assistance Program, which provides food aid to roughly 40 million Americans, will be fully funded through February." "But should the shutdown stretch into March its status is unclear: With just $3 billion in reserves, the USDA won't be able to cover the roughly $4.8 billion it pays in monthly benefits." "There is no guarantee recipients will get food stamps for March." "The impact of any lapse in these programs would be dramatic and unprecedented: The USDA says there has never before been a break in food stamp benefits since the program was made permanent in 1964." "Food banks are already stretched thin thanks to a notable spike in demand from furloughed federal employees, contractors and others out of work due to the shutdown." "This is a potentially catastrophic situation," said Carrie Calvert, the managing director for government relations at Feeding America, a hunger relief organization. "This could be an immediate emergency that grows exponentially." The covert channel, which dates to at least 2009, "aided in the release of detainees and helped pave the way for President Trump’s historic summit." "The secret channel between the Central Intelligence Agency and spies from America’s bitter adversary included two missions to Pyongyang in 2012 during the Obama administration by Michael Morell, then deputy CIA director, and at least one by his successor, Avril Haines." "U.S. officials sometimes called it the 'goon channel,' referring to North Korean interlocutors the Americans found distasteful but important." "Among two dozen possible candidates, virtually all have embraced universal health care in one form or another." 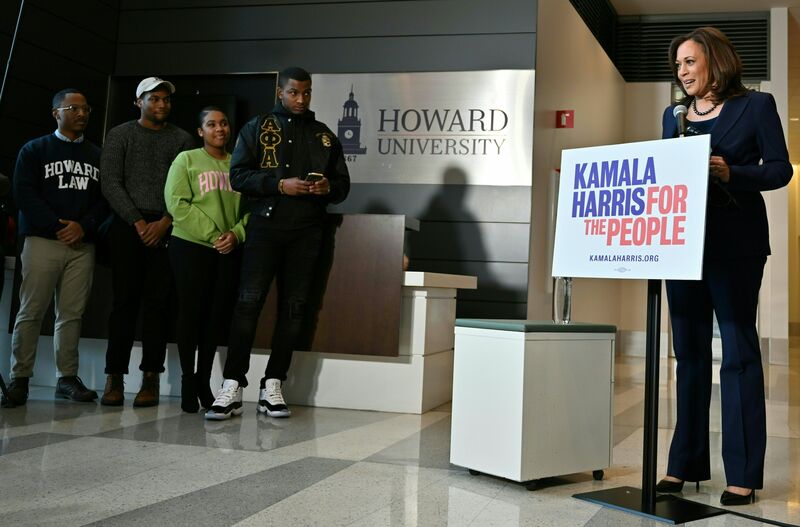 "Some have rallied behind free college, job guarantee programs, a $15 minimum wage and abolishing — or at least reconstituting — the federal agency that enforces immigration laws." "While few have outlined detailed proposals to fund their priorities, most would generate new revenue by taxing the rich." Why it matters: "[A] handful of moderate Democrats ... fear that promises by well-intentioned presidential prospects may create unrealistic expectations with their party's most passionate voters." Mike Bloomberg said on "The View": "If you go off on trying to push for something that has no chance of getting done, that we couldn't possibly pay for, that just takes away from where you can really make progress." President Trump made 8,158 false or misleading claims in his first two years in office, per the WashPost Fact Checker. More than 6,000 of those were in his second year. "The president averaged nearly 5.9 false or misleading claims a day in his first year ... But he hit nearly 16.5 a day in his second year, almost triple the pace." In Congress and on the presidential campaign trail, America is gearing up to tussle over big climate-change policy for the first time in nearly a decade. But what this actually means is up for massive interpretation, Amy Harder writes in her weekly column, "Harder Line." 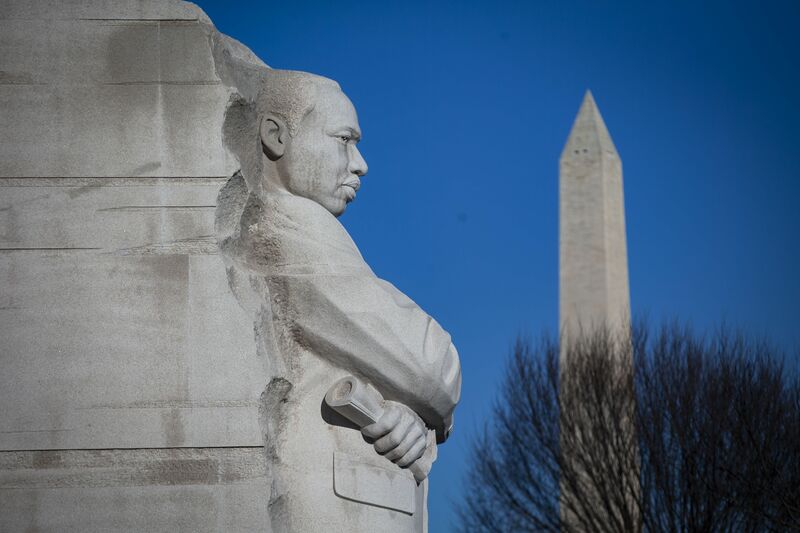 Why it matters: How Washington tackles this problem — whether through a tax, regulations and/or something else — will affect almost every swath of the country and reverberate around the world. At the heart of any climate policy is this tough task: Make fossil fuels more expensive without hitting American pocketbooks too much, and/or making cleaner energy technologies cheaper. Read on to consider the options: Regulations and mandates ... Carbon tax and dividend ... Subsidies ... Cap-and-trade ... All or some of the above. "The company said it is launching the service [today] in San Francisco and will expand to some stores in New York, Boston, Washington, Chicago and Los Angeles in coming weeks." "It tested the idea in 200 Miami stores last fall." "Starbucks says 95%of its core menu will be available for order using the Uber Eats mobile app. There will be a $2.49 booking fee."